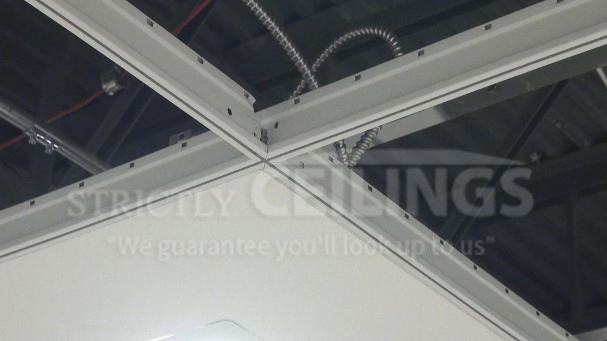 Installing ceiling tiles is the most rewarding part of suspended ceiling installation. It gives the ceiling that finished look that you’ve been waiting for. Once the room is completed, there’s always a sense of satisfaction that comes along with it. 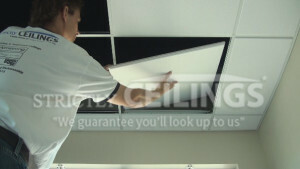 Cutting drop ceiling tiles can make or break your project when it comes to a professional look. You can carefully and meticulously install the ceiling grid and then ruin the ceiling by an unprofessional ceiling tile install. 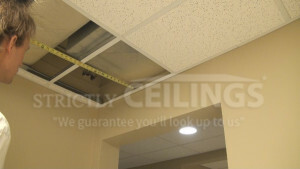 Let’s go through the proper installation methods for drop ceiling tile installation. Drop ceiling tiles are measured and cut differently depending on the type of ceiling tile and grid system that you are installing them into. You first need to determine what type of ceiling grid system that you have and what type of tile you will be installing. It doesn’t matter if the tile is fiber-based, vinyl or wood, you just need to know what the profile of the tile is. Ceiling grid and tiles can be used in any of the above combinations. Determine which one you have or would like to install. 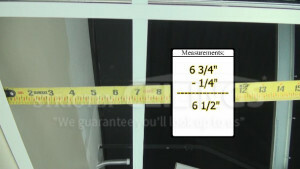 Take 2 measurements on each side of the opening because the wall may not be straight. Measure to the closest edge of the cross tee and add 1/8”. Place ceiling tile on a flat surface and using that measurement scribe a line the entire length of the ceiling tile. Use a sharp utility knife and cut the ceiling tile, making about 3 or 4 passes to cut all the way through. Install ceiling tile and check for fit. Tile should fit loosely but have no gaps. Take 1 measurement in the center of the opening. Measure to the closest edge of the cross tee and DEDUCT 1/8”. 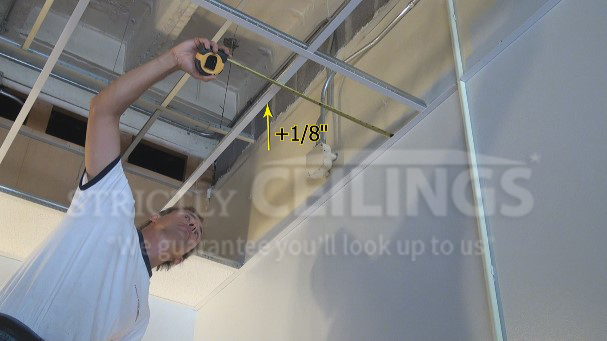 Place ceiling tile on flat surface and with that measurement scribe a line the entire length of the ceiling tile. Use a sharp utility knife and cut the ceiling tile, making about 3 or 4 passes to cut the tile all the way through. Install ceiling tile and pull the tile up to the cross tee making sure that it is square with the tee. Hold the tile down with your hand on the top of the tile and using a utility knife with your other hand, scribe a line along the wall angle making sure that you don’t allow the blade to come off the wall angle. Using your sharp utility knife, follow the scribe line and make 2 or 3 passes only cutting about ½ way through the depth of the ceiling tile. Using your utility knife again, run the knife along the cut edge of the ceiling tile 1 or 2 passes to the depth of the 1st cut you made. There should be a small Kerf approx. 3/8” x 3/8” x 24”. Remove it and discard. Re-install the ceiling tile into the grid and check the cut for straightness along the wall angle. There should be no gaps and the cut should be sharp looking without frays. Measure to the closest edge of the cross tee and DEDUCT 1/4”. Use a sharp utility knife and cut the ceiling tile making about 3 or 4 passes. There should be a small kerf piece approximately 3/8” x 3/8” x 24”. Remove it and discard. You will always want to install the ceiling tiles around the perimeter of the room first before installing any field tiles. These perimeter tiles are called border tiles. Installing the border ceiling tiles first will allow more access when installing. Many times a border tile will need to be installed through a full tile opening because of the lack of clearance in the area. There is always a desire to install full tiles before the perimeter tiles in order to get a good feel of what the ceiling will look like. It also makes a person feel they are getting more accomplished. I would caution you against doing this as some of the full tiles may need to be removed in order to install border tiles and you risk damaging or scratching the tiles. If possible, install all lighting and HVAC ducting and diffusers before installing field tiles. This will avoid having to remove tiles and possibly damaging them. When installing full tiles in basements, you will most likely need to tilt the tile in one direction in order to install it. If you find an area where the field tiles go in easily, use that area to install several tiles and then once above the ceiling grid move them over to areas where the ability to install them from below is not as easy. 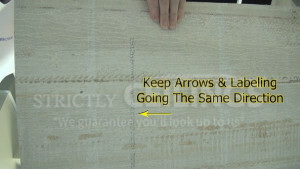 Be sure to look on the back of the ceiling tile to see if there is an arrow. Keep all arrows going the same direction. Take your time and don’t rush it. Ceiling tiles are not cheap. Always make sure you keep at least 4 to 6 tiles in storage just in case some get damaged after the install.